A performance of "Fantasie" by S.L.Weiss, based on the transcription from the Trinity College Grade 8 Classical Exam Book. 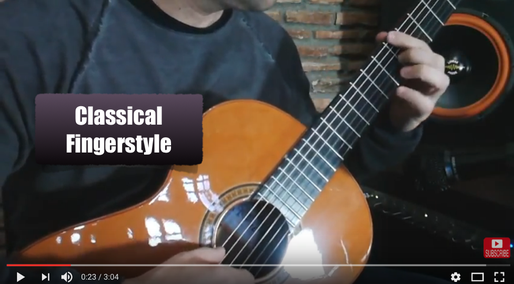 When I started playing guitar in 1987, at the age of 10, I studied classical guitar for a few years before beginning to discover modern guitar playing. The truth is in Cyprus I didn't have many choices at the time. But I did enjoy it thoroughly, and I also believe that my early classical guitar studies have given me a strong foundation for everything I have learned since. I still enjoy playing, and practicing classical repertoire, and occasionally I come across students who want to study classical with me. One of the pieces I have taught when preparing students for classical exams, is "Fantasie" by German composer and lutenist Silvius Leopold Weiss (1687-1750). Sylvius Leopold Weiss (12 October 1687 – 16 October 1750) was a German composer and lutenist. Born in Grottkau near Breslau, the son of Johann Jacob Weiss, also a lutenist, he served at courts in Breslau, Rome, and Dresden, where he died. Until recently, he was thought to have been born in 1686, but recent evidence suggests that he was in fact born the following year. Weiss was one of the most important and most prolific composers of lute music in history and one of the best-known and most technically accomplished lutenists of his day. He was a teacher to Philip Hyacinth, 4th Prince Lobkowicz, and the prince's second wife Anna Wilhelmina Althan. Drop D tuning (yes, metal players did not invent this). Tirando (free stroke) technique for arpeggio style, and contrapuntal passages. Occasional Apoyando (rest stroke) technique for emphasized scalar passages. Occasional simultaneous Tirando / Apoyando (tirando thumb, apoyando fingers).